NEW YORK—Mayor Bill de Blasio has directed a task force to reform how New York City’s corrections system treats the mentally ill, particularly incarcerated individuals where approximately 40 percent have mental health issues. The Task Force on Behavioral Health and the Criminal Justice System is to “transform the city’s criminal justice system,” according to the mayor’s office. 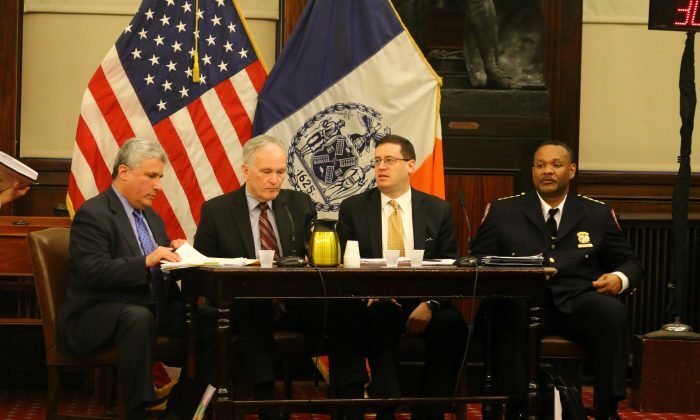 At a city council hearing Monday New York City Department of Correction Commissioner Joseph Ponte expressed concern. “It is clear to me that despite the tireless every day effort of many fine men and women, New York City Department of Correction is in deep trouble,” he said. Council members examined the newly appointed commissioner about such concerns such as mismanagement of inmates with mental illness, and increased inmate assaults on staff. According to Ponte, over the past four years inmate assaults on corrections staff have increased from 500 per year to 646. Some of the members of the group began to meet Monday. The first official meeting will be June 18. By September the group of city commissioners, high-level officials, and prominent advisers from the higher education and private sectors must give the mayor recommendations to improve mental health services for inmates in the city’s criminal justice system. De Blasio’s announcement comes on the heels of two cases of mentally ill inmates at Riker’s Island who died while incarcerated. In one case a mentally ill inmate sexually mutilated himself while in solitary confinement for seven days. In another case, a homeless veteran was left alone in his cell for hours as the temperature climbed to over 100 degrees. The man’s death is currently under investigation, according to a source familiar with the case. A major aim of the task force will be to come up with ways to reduce crime and its associated costs by dealing with mental illness outside of the criminal justice system. It will also analyze how to deal with the medical and mental health of those already in jail, and better ways to transition inmates back out into the world after their release. Greater public safety is also a major issue the group plans to address. The task force is multiagency, and includes the city’s Department of Correction, Human Resources Administration, the Department of Health and Mental Health, the New York City Police Department, the Administration for Children’s Services, other city agencies, and the New York State Department of Health. Several expert advisors are also involved. “The task force is going to develop real, actionable solutions to address the underlying challenges facing individuals and agencies, not just at arrest, but well before and after,” said Glazer in a statement.